Image caption President Uhuru Kenyatta denies helping to orchestrate the post-election violence in 2007 that killed 1,200 people. The prosecutor at the International Criminal Court (ICC) has asked for an adjournment in the trial of Kenyan President Uhuru Kenyatta. Fatou Bensouda said the loss of two key witnesses meant the case currently "does not satisfy the high evidentiary standards required". The trial was due to begin in February. Mr Kenyatta denies charges of organising ethnic violence after the 2007 election in which some 1,200 people died. In a statement, Ms Bensouda said a key witness had recently indicated he was no longer willing to testify and another witness admitted "giving false evidence regarding a critical event in the Prosecution's case". She said she now needed time to "complete efforts to obtain additional evidence, and to consider whether such evidence will enable my Office to fully meet the evidentiary threshold required at trial". Addressing "the people of Kenya", she said "my decision... was not taken lightly... I have and will continue to do all that I can to realise justice for the victims of the 2007-2008 post-election violence". The trial of Mr Kenyatta had been due to begin on 12 November but was put back until February after September's terror attack on the Westgate shopping centre in Nairobi that left at least 67 people dead. African leaders had been lobbying for the case to be delayed until Mr Kenyatta is no longer in office, saying the trial would make it impossible for him to run the country. The African Union has accused the ICC of unfairly targeting the continent's leaders. But a resolution to suspend the trial was rejected by the UN Security Council last month. 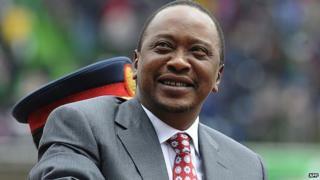 Mr Kenyatta is set to become the first serving head of state to go on trial at an international court. The trial of his deputy, William Ruto, began in September, although it was adjourned for a week so that he could return to Kenya to deal with the aftermath of the Westgate attack. Mr Kenyatta and Mr Ruto are accused of orchestrating the violence that followed the disputed elections in 2007. The two men belonged to rival groups at the time. Over several weeks, neighbours turned on each other, as lingering ethnic tensions burst into the open. People were dragged out of their homes and hacked and burnt to death in images that shocked the world. The two men formed an alliance to win the March 2013 election. They said it was an example of reconciliation but their critics said it was a cynical attempt to avoid justice.